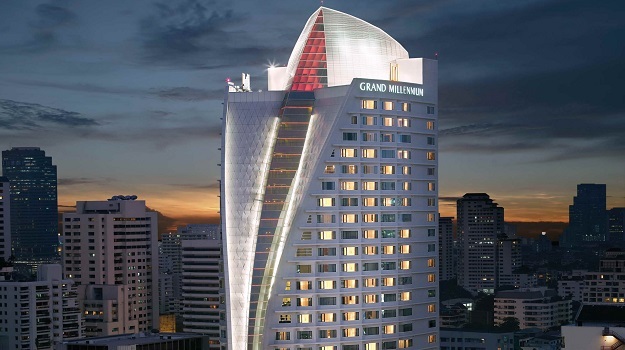 Grand Millennium Sukhumvit Bangkok is a 5 star hotel which features a sail-like glass façade, with an atrium and concept floors. Its 325 rooms and suites are spacious and tastefully decorated with contemporary Thai 'touches' and provide the latest in-room technology. Grand Millennium Sukhumvit Bangkok is located in one of Bangkok's prime central areas - on Asoke Road (Sukhumvit Soi 21). It is adjacent to the subway and skytrain stations: only one- stop by subway to the Queen Sirikit National Convention Centre and again a 'one - stop' by skytrain to the Emporium Department store. The hotel is a mere 30 minutes drive away from Bangkok's new Suvarnabhumi Airport. From Deluxe Room to Presidential Suite, quality is the signature across all of the room styles available, and in everything that is provided for you at this exceptional Bangkok Sukhumvit Hotel. Amongst Bangkok accommodation, The Grand Millennium Sukhumvit Bangkok is outstanding, with each room reflecting a remarkable commitment to top class service, contemporary comfort and attention to detail. Foreign attendees to Total Payments Asia will enjoy preferential rates at Grand Millennium Sukhumvit Bangkok. Details will be announced soon!